Back about two and a half years ago, I was in the process of getting this blog back on its feet after laying fallow for a couple of years. I was writing book and movie reviews, talking about the "post modern pulp" of the 60's, 70's, and 80's, and enjoying the conversations I was having with readers. I was also learning about the growing world of self-publishing, and beginning to form the idea that I might be able to focus myself and put 20 years of amateur writing to the test, in order to write my own book and put it out for the world to read. That's something I'd never done before, and the very thought of going it on my own, without an agent or a publishing house, was terrifying. I had a lot of people, book lovers like myself, warn me that if I went down the Dark Path of Self-Publishing, I'd become some kind of Pariah, an Untouchable if I ever wanted to enter the Real World of Traditional Publishing. But then I started to learn that I wasn't alone - there were others out there like me who'd seen this new world and the possibilities it held, and were venturing out there come hell or high water. One of these folks was a guy named Henry Brown, another book and movie blogger with a penchant for the same sort of "post modern pulp" that I enjoyed. We commented on our respective blogs and emailed back and forth, and when I saw Henry's book available on Amazon, I picked up a copy of the ebook (the first ebook I'd ever bought, by the way) and gave it a whirl, curious to see how someone much like me, with my likes and interests, had tackled this "self-publishing" thing. Well, to my pleasant surprise, and not inconsequential relief, Henry did real yeoman's work in writing Hell and Gone, his debut novel. The characters were fun, the action was fast and furious...well heck, I'll just link to the review I wrote back in the day. Authors like Henry and several others out there (Jack Murphy, I'm pointing at you...) gave me the confidence to believe that with some hard work and a little bit of luck, I could also pen and publish my own works. Fast forward a couple of years. It's now 2013, Henry and I are still posting comments back and forth, trading emails, and soldiering on in the world of self-publishing. Now, however, things aren't so lonely. The world of self-pubbing is a lot different now, and people are making names for themselves, solid reputations as writers who don't need the ancient machinery of a traditional publishing house to get their works out to the general public. I've got two books out and a third on the way, and Henry's second novel, Tier Zero, has landed. And by landed, I'm talking Normandy Invasion. Henry definitely delivers the goods with Tier Zero, and shows that he's developed and matured as an author. Hell and Gone and Henry's other short works are solid, entertaining, highly readable stories, but Tier Zero is a clear step above his earlier writing and exhibits a level of craftsmanship easily comparable to, if not quite a bit better than, any of the classic 80's-era fare he and I both love. Although I have no doubt legions of Men's Adventure fans have tried to imitate the writings of their favorite authors over the years, in Henry's case, the student has definitely become the master. To the jerkwads out there who complain that all self-published materials are little better than napkin scribblings peddled by illiterates looking to milk a fast buck out of a new fad, I say that books like Tier Zero prove in my mind that such beliefs are without merit. Is there junk out there? Absolutely. But believe me, Henry's published works are well-written, professional, and worth every penny paid for their entertainment value. 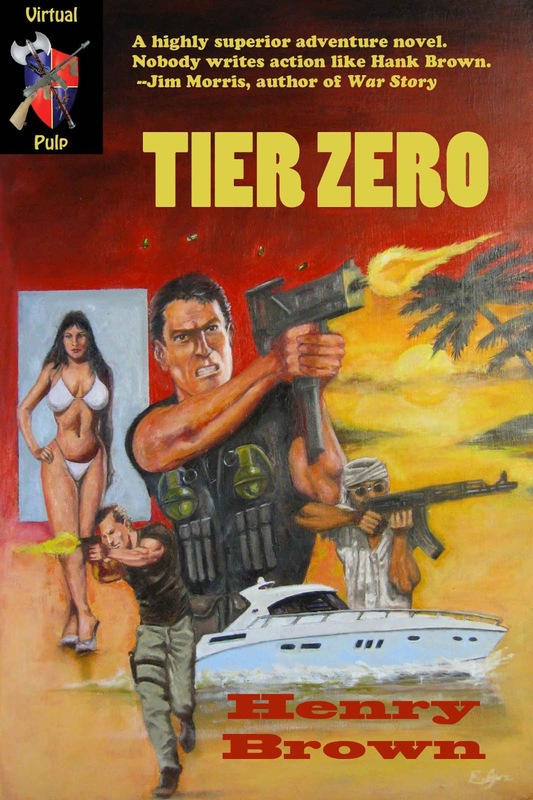 If you're a fan of the Men's Adventure fiction genre, if you like big guns, hot girls, pirates getting their butts kicked, brutal gunfights and tales of cunning tradecraft and high adventure in exotic locales, Tier Zero needs to be in your hands as soon as possible. Great post, Jack! Thanks for the kind words. You know, I struggled for quite a while myself with the self-publishing thing. Well, it wasn't so much a struggle--self-publishing was just unthinkable for the reason you mentioned, and others. Now I regret waiting so long to do it. I've been sitting on Hell and Gone for quite a while, unread. I'll rectify that "unread" part soon and dig into this one as well.